This collection of books in the Khmer language represents a selection of books from the National Library of Cambodia . 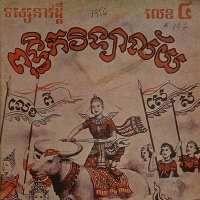 They were originally published from 1950 to 1973, between the final years of the colonial French Protectorate (1863-1953) and the takeover of the Khmer Rouge (1975-1979). The 50 digital books were produced under the direction of Dr. Pascal Bourdeaux by a project organized by the Center for Khmer Studies (Siem Reap, Cambodia) in 2006-2007. This project was supported by a grant from the US Department of Education's Technological Innovation and Cooperation for Foreign Information Access (TICFIA) program to DLIR partners. To learn more about this and other TICFIA projects sponsored by DLIR partners, consult the Local Archives and Libraries web site.